Mallorca, at 110 km South West to North East and 70 km wide, is the largest of the Balearic Islands, the other islands are Mallorca, Menorca, Ibiza & Formentera. 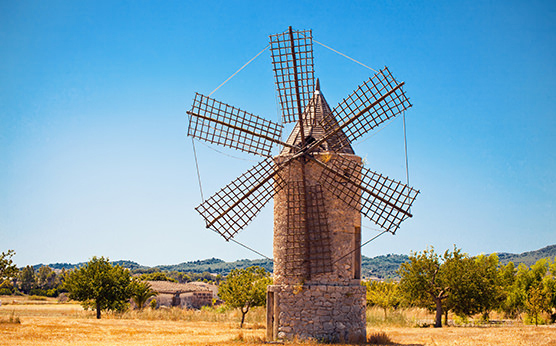 Mallorca enjoys a temperate climate with short, mild winters and long hot summers. With around one million inhabitants on the island, and 450.000 living in Palma, the capital city. Two languages are spoken here are Castellano (called Spanish outside of Spain) and Mallorquin, the regional variant of the Catalan language. The Southwest with its well-known towns like Puerto de Andratx, Portals and Santa Ponsa, is a very popular area enjoying a close proximity to Palma. Connected to the city and the airport with an excellent motorway, making the short trip easy. Andratx is a historic and relaxed country town, at the foot of the mountain Puig de Galatzo. By the seaside there is the port, the famous and luxurious town Puerto de Andratx. A large port with excellent restaurants along the seafront enjoying beautiful views throughout the year. Port Andratx has held onto its original charm and each day you can see the local fishermen returning with their boats. Further to west, through the mountains, you will find the town ofSant Elm. 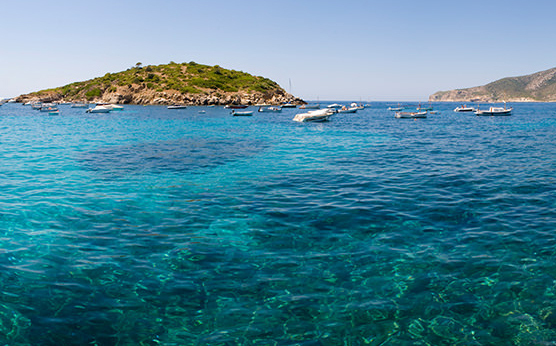 Mainly coming to life in the summer season, Sant Elm is still popular out of season with hikers and walkers. Moving inland, back towards Palma is the municiplaity of Calvia. This area is more mountainous with small picturesque towns like Es Capdella, Galilea and Puigpunyent. Along the coast you will find the popular tourist destinations Paguera, Magaluf, Palma Nova and Santa Ponsa. 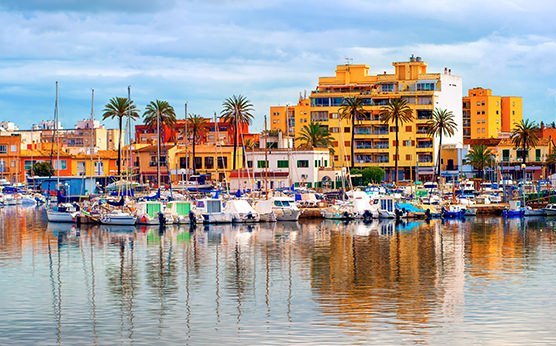 Closer still to Palma are the towns of Portals, Portals Nous and the well known and popular port Puerto de Portals, where you will find huge yachts, designer stores and gourmet restaurants. Close by is Bendinat; a relaxed residential area with close proximity to many of the islands golf courses. Then, nearest to Palma are the towns of Illetas and Cas Catala with great beaches and relaxed atmosphere. 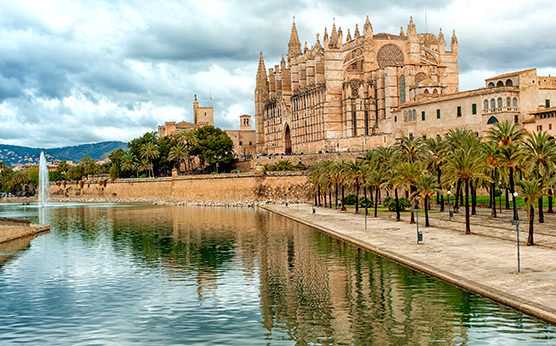 Palma is an international Mediterranean city offering locals and visitors practically everything. You can find excellent shopping, with anything from larger shops to many designer brands, art galleries, events and an every growing variety of restaurants, bars and clubs. When you visit Palma, you will discover a truly beautiful city with centuries old architecture, history and many stunning buildings, palaces and patios. Dating back to the Roman times, Palma was founded around 122 BC. In 902 BC the island later came under Arab rule, until the Christians took over in 1200. In 1230 King Jaume I ordered the magnificent Cathedral La Seu to be built next to the sea, serving as a sign for those approaching that Mallorca was now in Christian hands! Interestingly, Palma cathedral was built on a former mosque, meaning that the Cathedral faces Mecca, and not Jerusalem! Over the years, many changes have been made, expanding the city. Around 1900 the city walls were more or less torn down to make space for the large street called the Avenidas, that today surrounds the city. Palma has a wonderful Old Town core where the beautiful and central boulevard Paseo del Borne offers pleasant strolls under the palm trees and provides great shopping. In La Calatrava, also known as the Cathedral district, you can enjoy interesting walks among the historical city palaces and patios.Closer to the Old Town you will find popular areas such as Santa Catalina, Paseo Maritimo, Terreno, and Molinar which all have their own character. Slightly further out is the fishing village of Portixol a highly desirable area for residents and holiday home owners. The West Coast is a mountainous area, also known as the Tramuntana region. This area was hard to access for a long time, therefore is hardly inhabited. It is the rainiest region of the island and the soil is particularly suitable for olive groves. Popular, picturesque towns here are Valldemossa, Fornalutx and Esporles. The area around Soller is famous for its orange plantations. In 1912 the the railway line to Palma was constructed, allowing them easier and faster transport of their oranges to the city. This train still runs between Plaza de Espana in Palma to Soller. On the coast is Puerto de Soller, with its romantic setting. 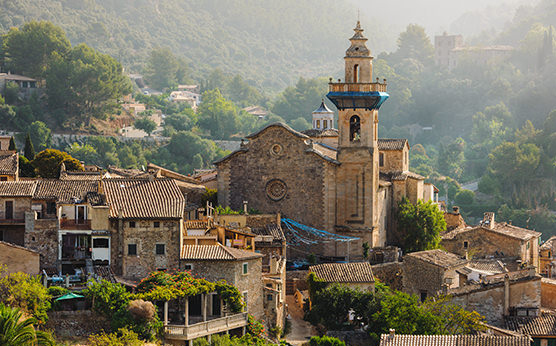 The beautiful town of Valldemossa is nestled in a valley, surrounded by mountains. Made famous when the French writer George Sand wrote a book about her time spending a winter here in 1838 together with her companion the Polish composer Fredric Chopin. Deia, a fairly remote village, offers its residents peace and quiet as well as inspiration. Over the years the town has drawn many famous writers, artists and musicians. The town of Alcudia stands where the Romans founded their first town in Mallorca in 123 BC, called Pollentia. Being completely destroyed in the 5th century by Vandals, those who survived moved further inland and founded Pollensa. Four hundred years later the Moors built a new town beside the Roman ruins, which is the Alcudia of today. Puerto de Pollensa, with its long sandy beach lined with many restaurants is located by a protected bay. The port is a popular seaside resort and has been so for many years. 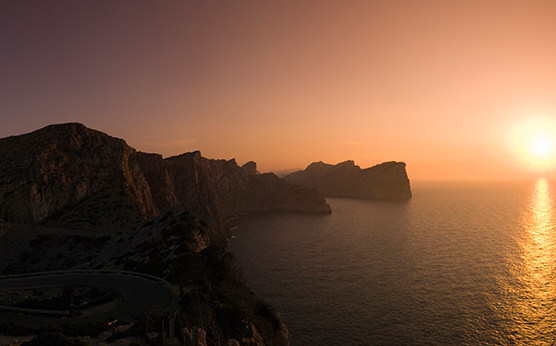 If you are up for the drive, Cap de Formentor offers a truly breathtaking and rugged landscape. The windy road with sheer drops ends at the lighthouse, built in 1862 proudly standing, looking out to the sea. South Mallorca only receives about a third of the average rainfall for the island. This area is one of the first in Mallorca to be settled on a permanent basis, with the protected bays prividing good shelter. Today there are flourishing vineyards all the way from Santanyi to Felanitx, the main produce of the region. Nine out of ten bottles of Mallorcan white whine comes from here. Santanyi is a very pleasant town with lots of character and nice atmosphere. It is one of the larger towns in Mallorca and connected to Palma by a motorway most of the distance. Santanyi is famous for its strong golden mares stone, which was used building the town hall of Palma in 1703. The central area was never as important as the coastlines, this changed when the Moors established their rule in 902 AD. They began improving the region by building terraces and establishing an irrigation system, making farming possible. Inca, one of the larger towns which became famous for the craftsmanship of their shoes. The most famous brands today are Camper and Lottusse. These shoe and leather goods factories and their outlets make Inca one of Mallorcas industrial centres. Binissalem has the right soil, the right amount of rain and the perfect micro-climate for wine. In the late 1880s the wine pest Phylloxera reached Mallorca forcing the the crop to be changed to almonds. Today the region again produces very good wines and the larger producers Ferrer and Macia Batle are well known. Santa Maria del Cami is a popular town close to Palma, with many activities all year round. Sineu, the previous capital of the Kingdom of Mallorca from the beginning of the 13th to the mid 14th century. The palace here was built in 1309 and connected to Palma by the first long firm road on the island. Sineu is a beautiful town, proud of its heritage. Alaro, in the 17th and early 18th century, was the perfect hideout for bandits since the surrounding mountains offered protection. In 1901 Alaro got electricity, something that not even the capital Palma had!